. Once all the chunks are downloaded the client can assemble them into a usable form. Now i will told you that how to download torrents from Idm or any other Download Manager. Below are some steps for this method. 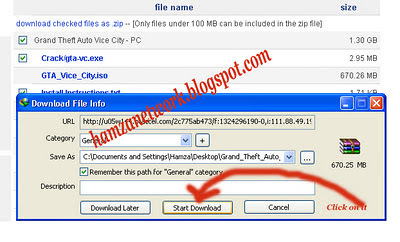 1. first you will have to copy the torrent URL which you are choosing to download. I am copying GTA Vice City Torrent url for your help. See the picture below. 2. Now Go to www.torrific.com and Login or signup. 3. Now paste you Torrent URL in Torrific Text box and click Get. When you will click on Get button Torrific will ask you to Compress your torrent, Click on Initiate Bittorrent. After this a Box of Torrent files will appear Like Below picture. you will have to click on one link which have not Tick Mark like 2nd or 7th link in above picture. When you will Click that link, a box from IDM or other download manager will appear. Now download your file and enjoy. If you have any problem about this topic the disscuss in comments. Thanks Buddy I Am Looking For This Greate Trick. I Am Move Lover So I Need This Trick Badly.